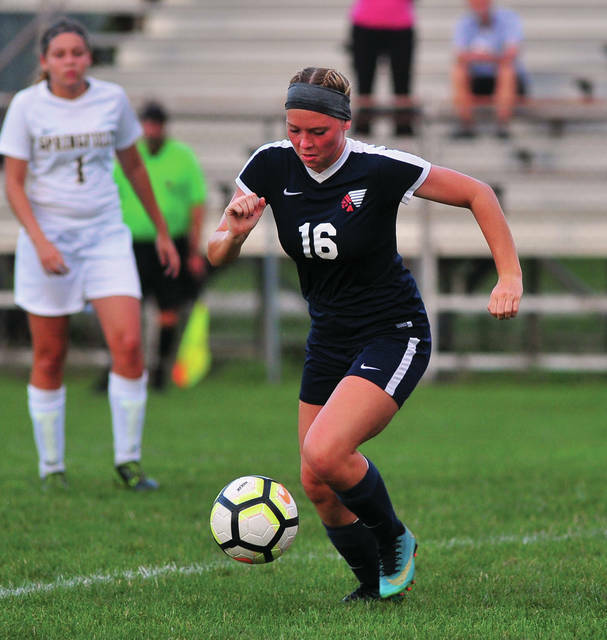 Piqua’s Madison McMaken battles for the ball against Springfield Wednesday. 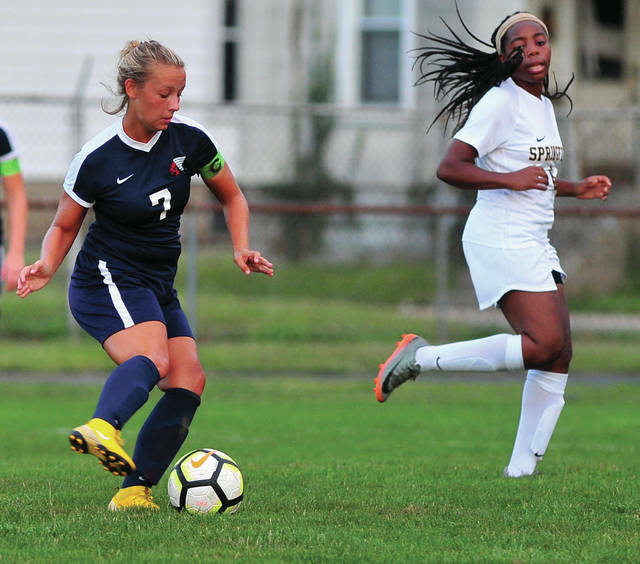 Piqua’s Shayna Bragg dribbles the ball downfield. Piqua’s Taylor Grunkemeyer sets up a shot against Springfield. 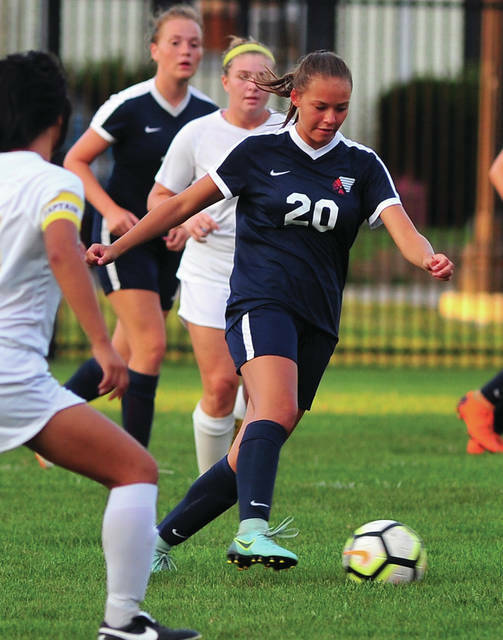 Piqua’s Whitney Evans looks to pass the ball. 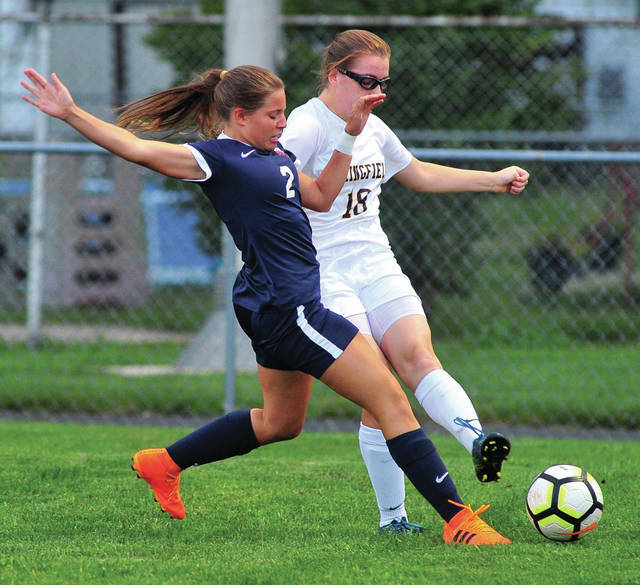 The Piqua girls soccer team and Springfield played to a 0-0 tie for a half before lightning stopped the game. The game is not expected to be rescheduled. The Piqua boys soccer team lost to Wayne 4-1 Tuesday to drop to 2-4-1 on the season. The Piqua boys golf team lost 173-190 to Greenville Wednesday at Echo Hills. Kyler Kommer led Piqua with a 45. Other Indian scores were Matt Herron 48, Decker Jackson 48, Jackson Huelskamp 49, Mason Price 52 and Christian Starrett 55. SIDNEY — The Lehman Catholic boys golf team picked up two wins. Cole Gilardi led all golfers with a 40 while Mikey Rossman had 42, Brandyn Sever had 52 and Alex Keller had 53. Lehman defeated Lima Perry 193-215. Gilardi led the Cavaliers with 41. Rossman shot 43, Keller shot 43 and Sever shot 58. The Piqua girls golf team avenged their early season loss to their GWOC American rival Greenville 200-212 Wednesday at Echo Hills. Kelsey Bachman was match medalist with a 43. Reece Tate bounced back from some recent struggles with a 50, while Skylar Sloan continued her steady play and shot 53. Rounding out the scoring was Adde Honeycutt and Hannah Anderson, who both shot 54. The Piqua JV team lost to the Greenville JV team 166-167. Scores for Piqua were Kenzie Anderson and Haley Krogman each with 55 and Brooklynne Wright with 57. GREENVILLE —The Miami East girls golf team defeated Franklin Monroe 196-231 in CCC action at Turtle Creek Golf Course in Greenville. With the win the Lady Vikings move to 4-3 over all and 1-3 in league. Paige Lawson was medalist and led Miami East with a 40. Other Lady Viking scores were Kearsten Kirby 47, Annelise Logan 54, Marissa Kearns 55, Maci Krites 57, Erin Baker 63 and Gretchen Stevens 68. SIDNEY — The Lehman Catholic girls tennis team lost to a strong Greenville team 5-0. In singles, Claire Larger lost 6-1, 6-0; Sarah Gibson lost 6-0, 6-1; and Angela Brunner lost 6-0, 6-0. In doubles, Ann Pannapara and Keira Burns lost 6-1, 6-0; and Shannon Staley and Brieanna Werling lost 7-5, 6-2. Ann Deafenbaugh won a JV singles match.